Vaughn Ernest Hansen died September 11, 2018 peacefully at home surround by family and friends. He was born July 26, 1921, in Syracuse, Utah to Ernest W. Hansen and Eva Millie Criddle. Above all that can be said of this giant of the Lord, it can be said that Vaughn loved the Lord with all his might, heart and soul. 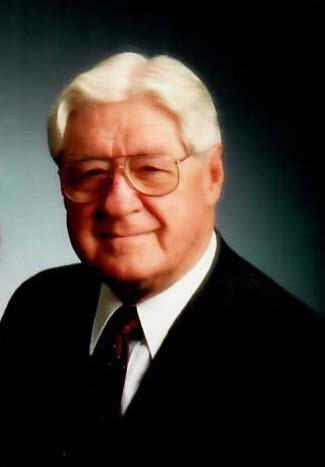 He served faithfully and untiringly throughout the world as he worked with many nations and their top leaders in the world to create and improve their agriculture and water resources. But he had a special gift to touch the life and penetrate the soul of every person he came in contact with. Everyone who knew him, knew he genuinely loved them. He was quiet, soft spoken and a noble man of God. However, Vaughn felt his greatest accomplishment in life was his marriage to his childhood sweetheart, Donell Gailey in the Salt Lake Temple on July 5, 1941. Together they had 10 wonderful children, whom they raised in a loving and happy environment. Donell passed away February 26, 1996. Judy (David) Wood, Jerry (Irene), Lanny (Diane), Devon (Jan), EvaMae (Robert) Cook, David (Leann), Gayla (James) Goodwin, Paul (Shelly), Marlin (Cindy), Lorin (Stacy). Vaughn leaves his blessing on 41 grandchildren, 102 great-grandchildren and two great-great-grandchildren. Vaughn was sealed eternally to Regina (Jeanie) Ann Holmes in the Jordan River Temple on February 27, 1998. They were married a little over 20 years before his passing, accomplishing much together in Church callings and service to others. Vaughn’s life was full of dedicated church service including leadership as a Branch President in Ohio at the age of 24 years old. A counselor in two bishoprics and two stake presidencies, and as a high councilor and a Bishop. Also he served 10 years on the first Church Correlation Committee, and the last five years of that service as Executive Secretary of all Church Youth Programs. Vaughn worked closely with six of the Prophets in The Church of Jesus Christ of Latter-day Saints. His professional career was extensive, graduating from the Utah State University with a B.S. degree in Civil Engineering. He volunteered for service in the Navy during World War II, and served as an officer and also as an LDS Group Leader or Chaplin. Upon returning from the war he obtained his M.S. Degree at Utah State University and fulfilled his PhD. Degree at Iowa State University. He taught and conducted research at Utah State University, publishing over 50 bulletins and papers, and also coauthored a text book, “Irrigation Principles and Practice,” that has been published in five languages. He served as director of the Engineering Experiment Station, and he designed and obtained funding for the Utah Water Research Laboratory in Logan Canyon. After 20 years of service at Utah State University Vaughn created and was president of Vaughn Hansen Associates, he was a water resource consultant to 25 countries, serving on every continent. Funeral services will be held Saturday, September 15, 2018 at 2 p.m. at the Syracuse South Stake Center, 3065 S. Bluff Road. Friends may visit family Friday from 6 to 8 p.m. at Lindquist’s Layton Mortuary, 1867 No. Fairfield Road and Saturday from 12:30 to 1:30 p.m. at the church. Interment, Syracuse City Cemetery.